PESHAWAR: Former provincial minister of the Pakistan Tehreek-i-Insaf and MPA Ziaullah Afridi on Tuesday alleged serious anomalies and violation of rules in the appointment of senior officers to the Khyber Pakhtunkhwa Ehtesab Commission and demanded the Peshawar High Court take a suo moto notice of them and stop the KPEC from holding the people accountable for their actions. During a news conference at the Peshawar Press Club, the MPA said he had produced sufficient documentary evidence of the violation of merit in the KPEC appointments but no one tool( action against the relevant officials. He said it was on record that a number of officials were using the KPEC to serve own interestsand that they had nothing to do with ensuring transparency in government affairs. The lawmaker claimed he was arrested on mala fide intentions. He alleged the rules were `completely` violated during the appointment of the `blue-eyed` persons of the government functionaries and that was why the KPEC had failed to deliver the goods against corruption. Mr Afridi said the provincial accountability commission had never been independent nor would it worl( independently in future if the uncertain circumstances prevailed. He said a person involved in corruption couldn`t hold others accountable and that the establishment of the KPEC was nothing but a waste of national wealth. Former minister alleged that the two KPEC officials, who had arrested him, were also involved in corruption but no action was taken against them. `I am innocent. 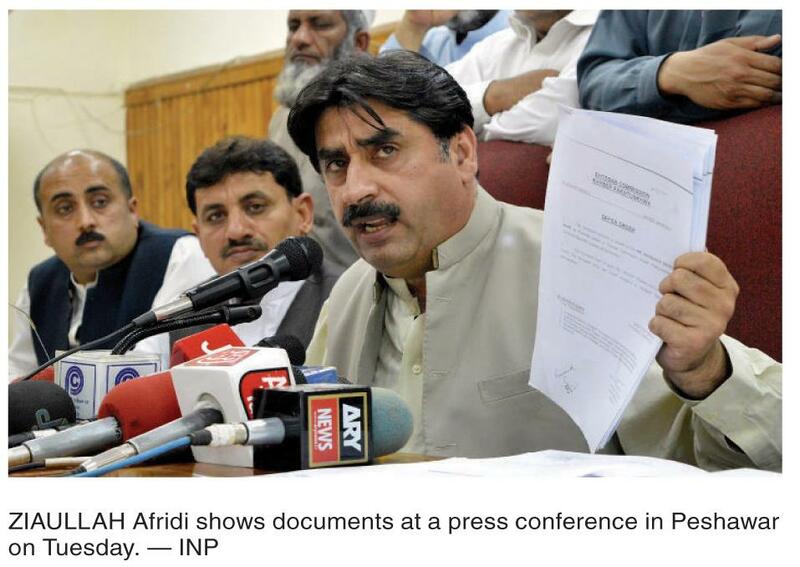 I have done nothing wrong and that is why the Peshawar High Court ordered my release,` he said. `I will try to get cases registered against the corrupt KPEC officials by the local police,` he said.While referring to some `documentary evidence`, Mr Afridi said one of the KPEC officials, who arrested him, had changed his date of birth during the appointment to the commission and therefore, he deserved to be punished strictly. He criticised former KPEC director general Hamid for committing `blunders` in the documents of employees. The lawmaker said PTIChairman Imran Khan was praising the role of the commission but he was unable to remove corrupt elements from it. He said the provincial government and whole provincial accountability commission was sham. Mr Afridi said he had decided to file a case with a local police station against the KPEC corrupt officials for violation of rules in appointments to senior commission positions.